By a / April 23, 2015 / . Alien She, organized by and exhibited at the Miller Gallery at Carnegie Mellon University in Philadelphia before opening at the Yerba Buena Center for the Arts in San Francisco, examines the influence of the feminist punk rock movement Riot Grrrl on artists working today. Curated by Ceci Moss and Astria Suparak, the exhibition presents archival materials (zines, mixtapes, music playlists, cassettes, fliers, t-shirts, video footage, and other ephemera) from the Riot Grrrl movement as well as work by seven contemporary artists whose “visual art practices were informed by their contact with Riot Grrrl,” according to the exhibition brochure. What constitutes “contact” differs from artist to artist. Some, including Tammy Rae Carland, Allyson Mitchell, Miranda July, Ginger Brooks Takahashi, and Faythe Levine, actually played in bands and made zines. Others, such as L. J. Roberts and Stephanie Syjuco, were inspired by the movement in more secondary ways and/or were mentored by its participants. All of these artists demonstrate strong affinities with the Riot Grrrl ethos in their concerns with alternative networks of communication and cultural distribution; collectivity and collaborative models of authorship; craft and DIY practices; issues of identity; and experiences of oppression and empowerment, especially as they relate to gender. Moving from the historical section of Riot Grrrl materials to the rest of the gallery requires confronting Roberts’s We Couldn’t Get In/We Couldn’t Get Out (2006–7), a towering chain-link fence knit out of fluorescent pink yarn. It is difficult not to read the haunting and beautiful piece, which at once obstructs and literally colors the rest of the exhibition, as an emblem for the artist’s own feelings of simultaneous confinement by and exclusion from fixed categories of identity (Roberts prefers the plural pronoun “they” as a resistance to binary classifications of gender). 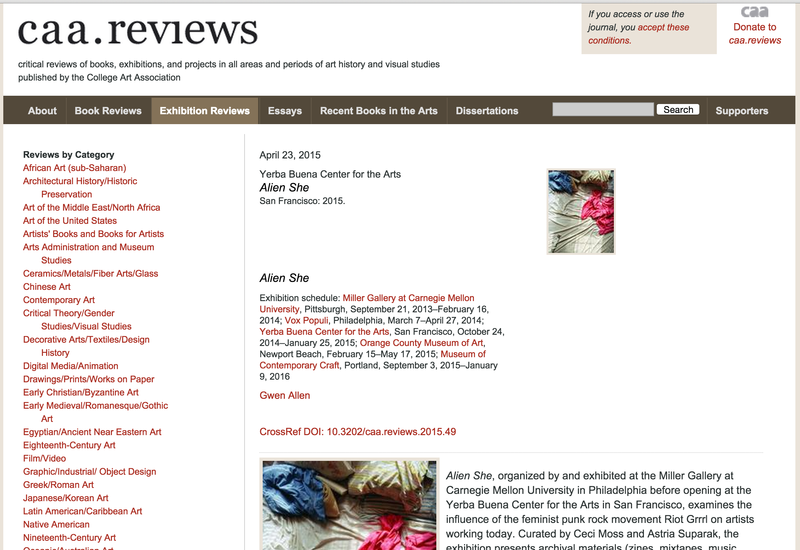 The piece also functions as an allegory for the themes of separation and estrangement, which are highlighted by the exhibition and signaled by its title, Alien She. The phrase is appropriated from a Bikini Kill song; the lyrics (“she is me / I am her”) explore the complications of female identity and the pressure to conform to social expectations and norms. Other artists likewise challenge received models of gender and prescribed social conventions. Mitchell’s Lady Sasquatch sculptures (2006–10)—fantastical, larger-than-life, anatomically correct woman-creature hybrids constructed out of fake fur—are monsters in Donna Haraway’s sense; they are amalgamations of fact and fiction that denaturalize nature, offering potentially liberating models of female sexuality and queer identity. Levine, known for her documentary film and related book Handmade Nation: The Rise of DIY, Art, Craft, and Design (New York: Princeton Architectural Press, 2008), as well as the more recent book Sign Painters (New York: Princeton Architectural Press, 2013), also explores alternative lifestyles and identities. Time Outside of Time (2010–ongoing) is a series of photographs documenting off-the-grid intentional communities. Images of communal kitchens, makeshift dwellings, and shared moments of work and recreation expose the hardships as well as the pleasures of contemporary homesteading. Alternative social structures depend crucially upon innovative modes of distribution and information sharing, and a number of artists explore the role of such networks in community building. Several of Brooks Takahashi’s collaborative projects are on view, including Project MOBILIVRE–BOOKMOBILE (2001–6), which involved using repurposed Airstream trailers as itinerant libraries to make artists’ books accessible in remote locations around North America, and LTTR, a gender queer feminist collective and art magazine (founded by Brooks Takahashi, K8 Hardy, and Emily Roysdon) featuring texts and printed multiples by artists and queer/transgender activists. Both projects constitute efforts to create solidarity and reach audiences outside of the art world. Likewise, July’s Joanie 4 Jackie (1995–2003), formerly called Big Miss Moviola, was a grassroots video distribution network for women artists, loosely based on the model of a chain letter. July’s more recent online project Learning to Love You More (2002–9) (with Harrell Fletcher) is a website that invited viewers to create and submit works of art based on a series of simple instructions, eliciting contributions ranging from the poignant to the absurd. Syjuco also relies on crowd-sourcing to affirm the creativity of everyday individuals in The Counterfeit Crochet Project (Critique of a Political Economy) (2006–present), in which she invites people to crochet copies of designer handbags, translating high-end luxury goods into wonky, faux versions. Also displayed are Syjuco’s copyleft projects such as FREE TEXTS (2011–12, updated 2014), handmade flyers with pull-off tabs that list URLs to open source documents, and Proxy Audio Manifestation (Total Bootleg Collection) (2010), which displays her extensive illegally downloaded music collection. In the spirit of Riot Grrrl, such projects resist the corporate ownership of culture and encourage the public to assert their rights to the cultural commons. Meanwhile, Carland explores the more personal side to alternative distribution networks and the communities they foster. Lesbian Beds (2002) is a series of photographs showing couples’ empty, unmade beds, suggesting the banal, yet politically charged, dimension of this most intimate realm. The more autobiographical One Love Leads to Another, from An Archive of Feelings(2008), is a visual index of the artist’s collection of mixtapes and hand-labeled cassette covers. It alludes to the ways in which such artifacts gain meaning within the context of interpersonal relationships and experiences of friendship, love, and heartbreak. The art world is definitely not without its faults as far as the inclusion of women goes. Women, Art, and Society by Whitney Chadwick was really enlightening for me. This book focuses on how women have been left out of art history, and describes the work of women artists from the Middle Ages to the present, including contemporary feminist artists such as Barbara Kruger and Cindy Sherman. The conditions under which women artists have worked and how they have NOT been represented is discussed. Alien She contributes to this history by not only illuminating but furthering the Riot Grrrl struggle to achieve visibility and equality for people of all genders—in the art world and real world alike.